To make an ideal icon, creativity is not enough. This is proved by the fact that, though created by undoubtedly creative people, bad icons are now among 3 major reasons for rejecting the app’s featuring on the App Store. If not originality, what matters in the icon then? Well, given that it forms the first impression of a user about your app, the icon needs to be beautiful and recognizable at once. How to reach these terms the following guidelines will teach. Choose a unique and simple shape for your icon. In this way it will be easily recognized and distinguished from the others at a glance or at a distance. Remember to make it reduce properly at screens of different sizes too. Choose the colors carefully. Operate within a limited palette – taking two colors is the best solution since icons with too many colors are not normally successful. Try not to use a photo as it makes your icon indistinct among others which incorporate pictures. Even if persisting in using a photo, search for alternatives. It can serve as the background or be combined with a picture. Avoid using a lot of text or do without it at all if possible. It is recommended to just use a logo or a symbol in an icon to make it as simple as possible visually. Another great idea is to test your icon against different wallpapers. If the user sets up some sophisticated wallpaper on his screen, your icon must be prepared for the challenge to look great on any of them. 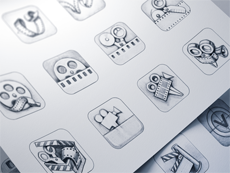 Use these helpful tips to create an easily recognizable and irresistibly appealing icon to instantly catch users and constantly keep them to your product of app development.